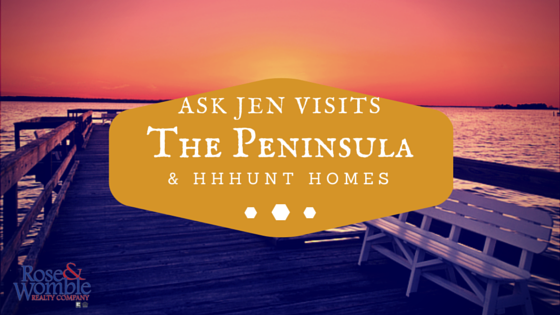 Ask Jen Live spent the afternoon on the Peninsula and she discovered it’s a great place to build a new home. The section of Hampton Roads known as the Peninsula is a great place to live, work, and play. Made up of the cities of Hampton, Newport News, and the famous historic triangle of Jamestown, Yorktown, and Williamsburg, the Peninsula enjoys a rich history and great new home options from HHHunt Homes. The Alexander model you can find at Carter Estates is a great choice for families seeking a new home because HHHunt gives you so many options to customize it. At the starting price you will get a 3 bedroom, 2.5 bath home with an owner’s suite. There is an option to change the upstairs loft into a fourth bedroom, and don’t forget to ask about the optional screened-in porch for enjoying the backyard bug free. Carter Estates is located in the upper section of Newport News, giving you access to great areas of the Peninsula including Busch Gardens, the Williamsburg Pottery, and Newport News Park. The Peninsula also features cool local events including the Pork Warwick Summer Concert Series. Port Warwick is a mixed-used community with popular local restaurants, shops, and a wonderful outdoor square named after famous author William Styron, who was born in Newport News. Every Wednesday, people bring out the lawn chairs and blankets and enjoy awesome local music. Plus, they can get a treat from Scratch Bakery and their famous cupcakes, or take in dinner at award-winning Fin. Newport News also has City Center, which is just down the street from Rose & Womble’s Peninsula Resale and Property Management Office. City Center hosts all the city’s municipal offices, plus has Paragon Theaters, a movie theater with reserved seating and some amazing popcorn. Dining options include Hampton Roads favorite Taste Unlimited and Hayashi, a great Japanese restaurant. On Thursdays, City Center hosts a great farmer’s market with local produce, meat, veggies, and other treats. Both City Center and Port Warwick are close to Carter Estates. Yorktown is a popular section of the Peninsula, especially its Riverwalk Landing, which is a great collection of locally owned shops and dining options. Also, there is Riverview, a mile-long pedestrian walk along the York River from the Yorktown Battlefield to the Yorktown Victory Center. This section of the Peninsula connects to the wonderful section of Hampton Roads called Gloucester. Just past the Coleman Bridge, Gloucester is close enough to everything, but just far enough to be super peaceful and quiet. The HHHunt community of River Club at Twin Island is the perfect escape for home buyers who want great water views. Not to be outdone, the City of Hampton also has great new home options from HHHunt. Buckroe Bayfront has been a popular choice for homebuyers, and it is close to Buckroe Beach and Ft. Monroe. Check out HHHunt’s cool design your home feature so you can preview what your home could look like. Ft. Monroe is quickly becoming the place to have fun in Hampton. The Paradise Ocean Club is a great place to play. It has a private beach and some amazing seafood and adult beverage options. Engineer Wharf offers saltwater fishing, and there is also so much history to be discovered. Downtown Hampton also hosts a block party every Saturday night in the summer. The block has great local food options including The Taphouse and Marker20. Jen didn’t forget about her four-legged friends from the Norfolk SPCA. Palmer is a terrier, American Straffordshire mix who loved when Jen brought him to Buckroe Beach for some fun in the sun. HHHunt will pay for his adoption fee if he’s is adopted within the next two weeks – so go by the Norfolk SPCA and meet this charmer. For more information about these or any of the #RWNewHomes all you need to do is to contact Jen at 757-774-6999 or you can visit at RWNewHomes.com.